Paolo Siciliani, Nic Garbarino, Thomas Papavranoussis and Jonathan Stalmann. Systemically important banks are material providers of critical economic functions. The Global Financial Crisis showed how distress or failure of one of these firms may have a severe impact on the financial system and the real economy. Systemic capital surcharges protect the economy from these negative spillovers by decreasing systemically important firms’ probability of distress or failure. A graduated approach facilitates effective competition to the extent that the capital surcharges faced by firms are more proportionate to the scale of systemic risks that they pose. This post illustrates some of the competition implications with respect to the methodology used to set the number and level of thresholds. 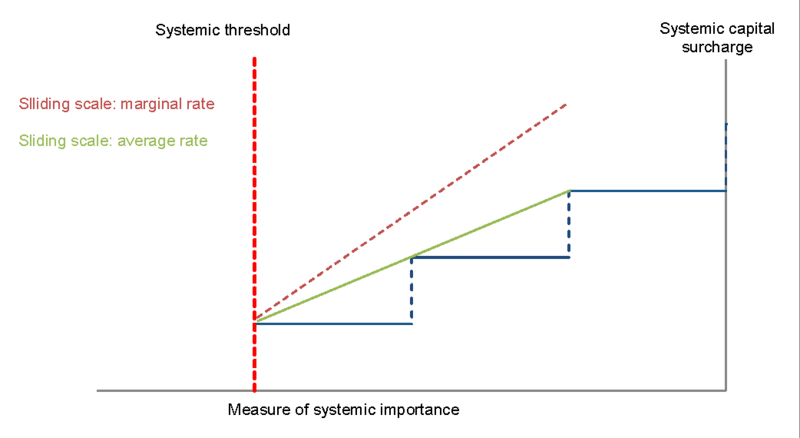 Institutions’ systemic importance is typically assessed using systemic importance indices measuring their activity in one or more financial services (eg, the simplest version being a measure of total assets). Firms exceeding a certain threshold level of systemic importance are assigned capital surcharges, typically expressed as a percentage of risk-weighted assets (RWAs). The relationship between systemic importance and capital surcharges rates is usually described by an increasing, step-wise function of further thresholds. A methodology that could be used to establish firms’ systemic importance and thus set thresholds is to calculate market shares. Setting thresholds based on market shares, however, may have unintended consequences if it facilitates the pass-through to customers of the cost increase faced by a firm that crosses a threshold. This may be the case if firms subject to lower or no capital surcharge adjust their prices upwards in response to the price increases of rivals facing higher surcharges. Firms would generally let their prices increase in response to a jump in demand triggered by an increase in prices by competitors intent on passing on their cost increase to customers. However, firms subject to a lower surcharge (or none at all) would typically raise their prices by a lesser amount than if they were also subject to the higher surcharge. This would tend to constrain the ability of larger firms to pass on asymmetric surcharges to customers through their prices. Nevertheless, setting the thresholds based on market shares might amplify this matching response to the extent that firms subject to a lower surcharge are concerned that by not adjusting prices upwards they might pick up too much market share and end up being hit with a higher surcharge upon crossing the next threshold, provided that they are close enough to it. This can be the case even if their volume of activity decreased (in absolute terms, but not as much as total volumes across the market) in response to the price increase thereof. Moreover, during a phase of financial stress which triggers downsizing by at least one large firm, the use of market shares might exacerbate things to the extent that rivals are less willing to absorb pent-up demand generated by deleveraging. Step increases in capital surcharges might reduce the incentives to expand around thresholds, both immediately below and above it, depending on the magnitude of the increase (the ‘cliff-edge effect’). There is an obvious trade-off between the number and both the height and the width of the steps. At the limit, in order to remove the ‘cliff-edge effect’ arising from discrete rate levels, the step-wise approach could be replaced with a sliding-scale one where the capital surcharge increases linearly. From a practical point of view, however, the main drag with this approach is that firms’ treasury functions may find it difficult to allocate capital to various business lines, concurrently vying for scarce capital, given the uncertainty as to what would be the actual score in terms of systemic importance (and thus the actual capital surcharge) in real time. This is particularly the case where the surcharge is recalculated periodically (eg, at the end of the year), so that the capital charge will be based on the expected score at the time of the review. A solution to may be to adopt an incremental approach like income tax, whereby above a threshold the capital surcharge increases, but only for assets above that threshold, rather than across the entire balance sheet. However, this approach might give rise to other distortions, given that separate chunks of otherwise similar activity would attract different rates only to the extent that they were originated during different phases of expansion. For example, a new loan might be subject to a higher capital surcharge than the renewal of an existing similar loan originated before crossing a threshold. This might blunt competitive rivalry to the extent that a prospective lender may have to ‘compensate’ the targeted borrower whose loan was originated with the current lender under a lower (legacy) rate; whereas upon switching to a new lender the loan may be subject to a higher (current) one. In any case, rather than applying several (incremental) rates to different sections of a bank’s balance sheet, firms would most likely end up using a ‘blended’ (average) rate applied across the board, ie, similar to the sliding scale approach discussed above. The potential adverse competition impact of ‘cliff-edge effects’ would be at least partly offset by the consideration that expansion within brackets (at the expense of rivals located in brackets subject to a higher surcharge) is facilitated. Moreover, the use of wide steps makes it more likely that more than one firm would be located in each bucket. Firms located in the same bucket but further away from the next threshold will have room to expand towards the upper bound of their bucket, which would put pressure on larger firms. In any case, banks typically develop their capital planning over the medium/long term. This is because they prefer to accumulate capital organically through retained earnings and, thus, capital targets are generally reached gradually over time, which should smooth out the impact of discrete increases of capital surcharges. Indeed, firms would have more room to prepare under a step-wise approach, for the simple fact that the increase in the capital surcharge is postponed compared to a sliding-scale approach (as shown in Figure 1 above). It could be argued that competition could be distorted also to the extent that the systemic importance of firms rises more than proportionately in size in a continuous (say, linear) fashion, as indeed entailed by the progression of rate increases. Therefore, in contrast to the sliding-scale approach, the flatness of the average rate within brackets under the step-wise approach would not reflect the increasing systemic importance as firms expand within a bracket. This line of argument is premised on the presumption that prudential regulators can perfectly align capital requirements with the underlying source of risk, in this case systemic importance. However, we live in a ‘second-best’ word, which means that regulators should be alive to the temptation of ‘spurious accuracy’ at the expense of simplicity and predictability. The marginal surcharge rate may increase at different rates as firms move up the steps. Increasing rates will concentrate cost increases at the high end of the scoring range, whilst decreasing rates will do so at the low end. In the case at hand, this choice should be primarily motivated by an understanding of the relationship between, typically, size and systemic risk. The conjecture that above a certain size systemic risk grows at a rate that increases more than proportionately favours an increasing (convex) graduation; the opposite a decreasing (concave) graduation. In the presence of large scale and scope economies, typically due to the need for an extensive branch network and IT infrastructure, convexity might prevent firms from reaching their optimal scale. It is far from clear, however, the extent to which there are large operational scale economies. Moreover, the role of scale economies may dramatically change in the near future thanks to the adoption of a number of digital technologies. All in all, in the face of ambiguity, a neutral approach with linear graduation would be preferable. Thinking about competition impacts is helpful in avoiding unintended consequences in the design and calibration of proportionality thresholds triggering cost increases – i.e., due to the imposition of a higher regulatory standard. The design and calibration of systemic capital surcharges, where a gradual approach with rates increasing with systemic importance is justified on proportionality grounds, is a case in point. Regarding the progression of rate increases, the step-wise approach, whereby rate increases apply across the entire balance sheet, may appear questionable at first scrutiny to the extent that it might exacerbate ‘cliff-edge effects’. However, besides its comparative simplicity and predictability, this approach has redeeming features in light of the fact that banks tend to set capital plans over an extended horizon and show a preference for organic growth through internal financing. Regarding the graduation of the rate curve, in the face of uncertainty as to whether and where there are scale and scope economie, a linear graduation of the step-wise framework is preferable. Paolo Siciliani, Nic Garbarino and Thomas Papavranoussis work in the Bank’s Policy, Strategy and Implementation Division and Jonathan Stalmann works in the Bank’s UK Banks Division.